One of my favorite parts about the holidays is crafting with my kids. Since all three of my kids are young, the easier the craft the better. Felt is a favorite craft material in the Stavish house. Here are some adorable felt crafts you can help your child create. Cut various-sized ornaments out of felt and have your child decorate them with glitter and glue. String a festive craft ribbon somewhere in your house and hang the ornaments on the ribbon using clothes pins. Each night, have your child take down an ornament and place it on your Christmas tree. In our house, we are a dual-holiday family, meaning we celebrate Christmas and Hanukkah. My mom was raised an orthodox Jew and taught us about her heritage, so we always celebrated Hanukkah. I grew up with a Christmas tree, too. I want to pass along this tradition to my boys. Last year, I created a huge felt menorah, which they enjoyed lighting every night by placing another flame on a candle. It was an easy way to safely involve them in lighting the menorah, and I'm looking forward to setting it up for them again this year. I found Chery's felt Christmas tree craft on Pinterst two years ago and just loved it. 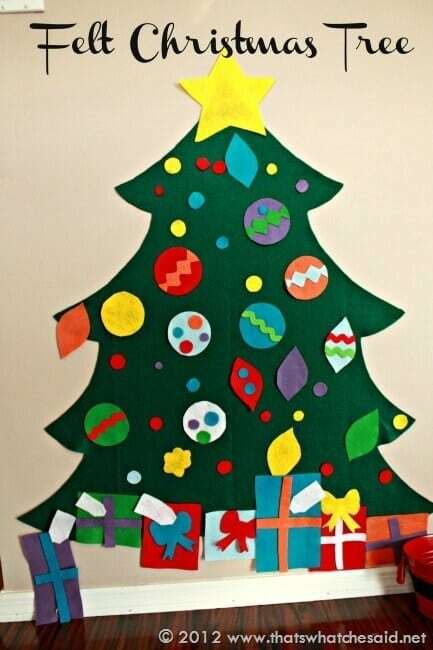 Sadly, much like 90% of the other great craft ideas I pin, the felt Christmas tree was never created. This year, I must change this! I'm already far ahead of the game, as I have all the necessary felt to pull it off. Be sure to check out the full details on this adorable Christmas tree craft at That's What Che Said. My kids are always a bit bummed when the holiday decorations are taken down. This year, I would love to create a large felt snowman for them to play with after the holidays are over. From different-colored scarves to different-shaped buttons and eyes, there are many ways to personalize your snowman. Break out the glitter, sequins, pom poms,and hot-glue gun and help your child create their very own super tacky felt stocking. If you're feeling extra crafty, you could even make a felt fireplace and hang it up in their room. How many cool-mom points do you think that would get you at the playground? What holiday crafts do you hope to do with your child this season?